Published in Rafu Shimpo, August 4, 1950, Japanese section. 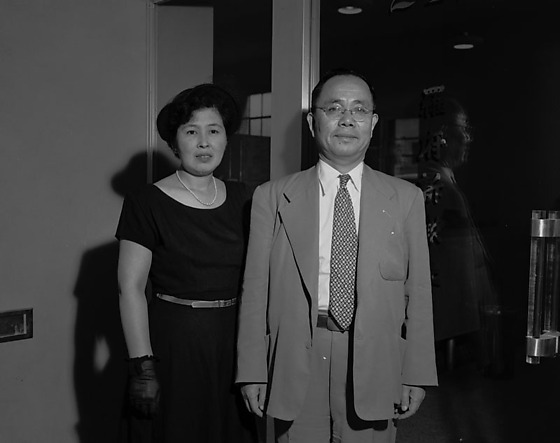 Tsuyoshi Suzuki, president of Osaka Bank, and wife at Rafu Shimpo office in Little Tokyo, Los Angeles, California, August 4, 1950. The couple stands in front of glass doors; the woman wears a black dress, hat and black gloves. Includes a portrait of a man in suit and round-rimmed eyeglasses standing in front of Rafu Shimpo building. "Rafu Shimpo, L.A. Japanese Daily News" on wall. 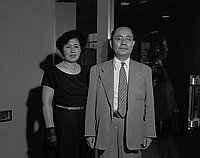 Typed on original negative envelope: Osaka Bank President.